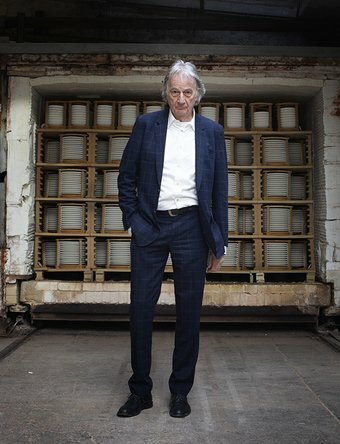 Sir Paul Smith is one of Britain’s foremost designers. He is renowned for his creative spirit, which combines tradition and modernity. Famous for its clothing and accessories collections, Paul Smith specialises in an inventive use of traditional craftsmanship and cutting-edge design to create beautifully made, desirable, modern pieces. Paul Smith is loved across the world. From its origins in one small shop in Nottingham, England, in 1970, Paul Smith has grown into a global business, selling in over seventy countries. Starting with one men’s collection, the business now comprises collections for men, women and children, including, shoes, accessories, fragrance and home furnishings. Throughout its development, Paul Smith’s values of curiosity, quality and authenticity have remained constant. Stack begins a partnership between Paul Smith + 1882 Ltd. and forms part of an on-going relationship. Each piece in the Stack Collection is unique making each Stack a work of art. Stack is a special series of vessels – appearing as a stack of plates, yet functioning as a vase, with each ‘plate’ hand glazed in colours inspired by Paul Smith’s iconic stripes. To produce Stack requires a complex process from making each individual stacking element of fine bone china, through to the highly skilled colour matching and application. On making each plate, after the first kiln (1250 C), they are then glazed and fired again (1060 C). They are water jet cut to provide the vase cavity, hand glazed in each one of the 40 colours of multi stripe and then fired again. The elements are then put back in the stack and placed in the kiln for the third time and fired again, which allows the glaze to fuse together the elements to create the finished Stack. Finally a hand painted burnished gold piece completes Stack.